Voyager 750 L / RH Both models in the Voyager range are of solid aluminium construction supplied with one aluminium and one carbon spool, have solid aluminium bodies featuring the same, extra large bail arm roller to eliminate line twist, a positive anti-reverse system, micro adjustable rear drag, balanced handles with rosewood grips, the only difference being their line capacities and size. The 750 has a line capacity of 180m 0.25, 165yds 10lb. 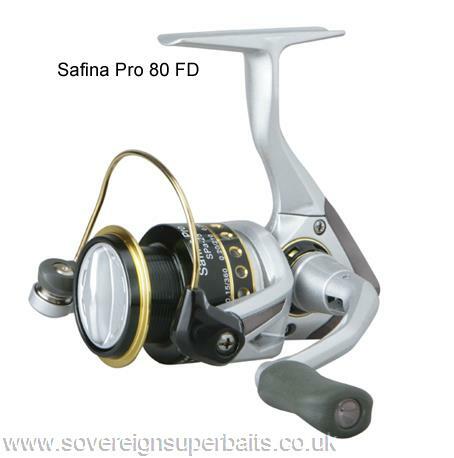 These reels both have excellent line lay and represent extremely good value for money. Voyager 800 L / RH Spec as for the 750 above. The 800 has a line capacity of 150m 0.28, 195yds 10lb. Subleme 3000 L / RH This reel along with its larger brother is possibly the best fixed spool reel we have ever come across with a all-aluminium body. The line lay on both the 3000 and the 4000 is impeccable comparable with reels of six times the price. The 3000 has a retrieve ration of 5.2:1 with 11 ball-bearings, a machined aluminium spool, titanium lipped to reduce static and improve castability with a titanium bail arm and extra large bail arm roller to reduce line twist to near zero.It has a line capacity of 125m 0.25, 137 yds 6lb, is furnished with a rosewood grip, comes with a spare aluminium spool and a free neoprene reel bag. Subleme 4000 L / RH All spec as for 3000 excepting the retrieve ratio which is 5.3:1 and the line capacity which is 150m 0.28, 165yds 8lb. We cannot recommend these 2 reels highly enough. They represent excellent value for money and perfection in engineering. Bertus I.T.T. Seducer Reels: Both reels have a 5:1 ratio and 7 ball-bearings, infinite anti-reverse and both reels are purpose built for lure fishing. As you would expect from something that bears Bertus’ name, these reels are made to the highest possible standard. They have superb line lay, are made of the finest materials and the only difference between them is their line capacity. The 2000 holding 280m of 0.15 braid and the 3000 holding 200m of 0.20 braid. Bertus I.T.T. 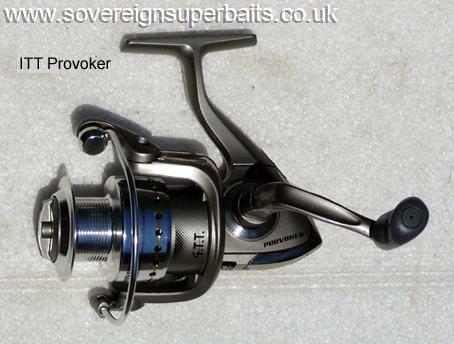 Provoker Reels: These are the cheapest in the range of ITT reels and they don't seem to be lacking anything in quality. They have 6 ball bearings, are compact, smooth and have great line lay. A great reel for a great price. Bertus I.T.T. One2Spin Reels: This reel is another excellent offering from ITT, it is cheaper than the Seducers above but frankly we can't see any difference in the quality. 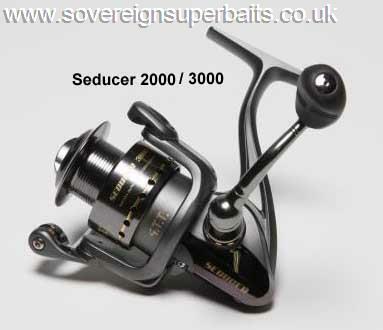 There are 6 ball bearings which is one less than the Seducers but these reels have all the same attributes. Okuma Safina Pro Reels: The Okuma range needs no introduction and this model is no exception. 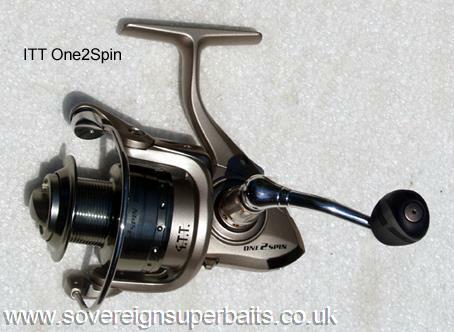 All the features you would expect from a top quality reel, quick set anti-reverse, ultra light and compact graphite body, 2 colour anodised one-piece machine cut aluminium spool and with 4 ball bearings. Okuma Aveon AE55 Reel: This reel is another in a small range of top quality reels we have acquired by the back door and l is meant for the Australian market where everything big and toothy fights hard. This reel is specifically designed for lure fishing, has 11 ball bearings and other features you would only find on a reel of several hundred pounds, it comes with two spools which are individually CNC machined from a single billet of aluminium. While this method of spool manufacture is common in multipliers you only find it in the top 10% of fixed spool reels. The spools are highly polished, designed specifically for fishing with braid. The reel comes with a weighted ergonomic handle and the latest spring loaded locking collet which means no undoing nuts or pressing dodgy switches to fold the handle away. This reel retails for just under $300 in Australia which is around £150 and we have a small supply at a fantastic price. Vantage FX20 Reel: This is a fantastically priced lure / spinning reel from a company with a huge pedigree. 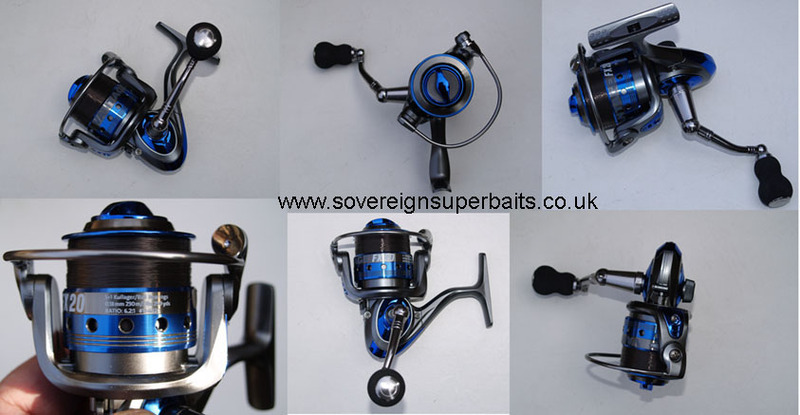 Beautifully finished with a blue anodised CNC machined spool and matching side plates, oversized ergonomic balanced handle, infinite anti-reverse, adjustable left or right hand, weighs in at under 300g, has 6 ball-bearings, 6.2:1 retrieve ratio. All in all this is a cracking piece of kit for not a lot of money.